Big news, Zeds Dead fans! The duo is returning to the Red Rocks Amphitheater for the fourth annual Dead Rocks show over two nights. On Tuesday 3rd July 2017, get ready for Zeds Dead along with a colossal lineup including Ghastly, Rezz, Camo & Krooked, Nebbra, GG Maree and Pham!! Tickets selling FAST – get yours now while they last!! Throughout 2016, Zeds Dead had what they have described as their “best year yet”. 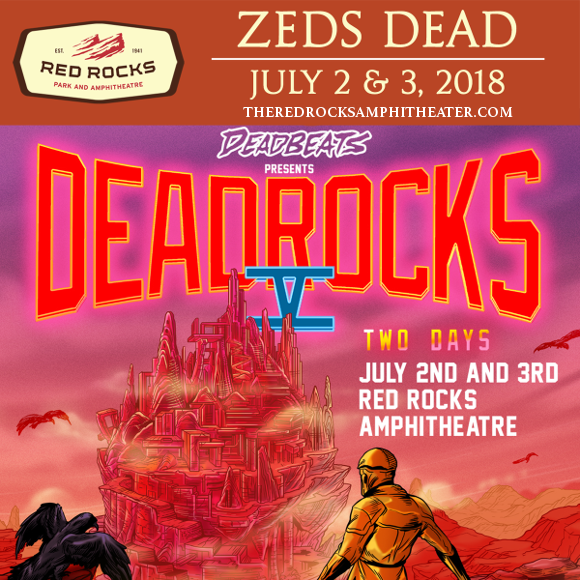 After being on extensive tour with their long awaited first full-length release, “Northern Lights”, and starting their own record label, DeadBeats, Zeds Dead have kept 2017 relatively light – with the exception, of course, of their essential concert: headlining the now-traditional Dead Rocks show at the Red Rocks Amphitheater!! If it’s going to be anything like last year’s show – in which Zeds Dead pulled off an incredible performance despite severe bad weather – then we’ve got the show of a lifetime to look forward to. With performances from Ghastly (David Lee Crow), Rezz (Isabelle Rezazadeh), in addition to special shows from the incredible Camo & Krooked, Nebbra, GG Magree, and Pham, its going to be an amazingly intense night of amazing bass vibes. What are you waiting for?? Get your tickets NOW while you still can! !